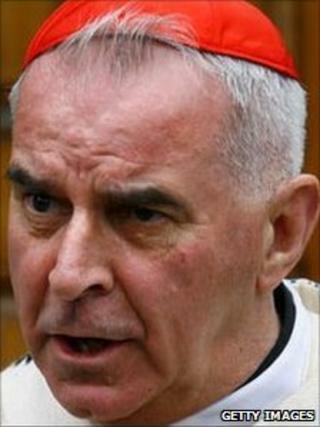 The leader of the Roman Catholic Church in Scotland has attacked the US over the release of the Lockerbie bomber. Cardinal Keith O'Brien said the Scottish government was right to free Abdelbaset Ali al-Megrahi last year on compassionate grounds. US lawmakers want Scots politicians to explain their decision to a committee, but the cardinal said ministers should not go "crawling like lapdogs". He said Scotland had a culture of care, while the US was fixed on vengeance. Scottish Justice Secretary Kenny MacAskill released Megrahi, who has prostate cancer, after being told that three months was a "reasonable estimate" of his life expectancy. However, he is still alive after almost a year and the decision continues to provoke anger in the United States, which was home to 189 of the 270 people killed on board Pan Am flight 103 in 1988. In an interview with BBC Scotland, Cardinal O'Brien said Americans were too focused on retribution. "In many states - more than half - they kill the perpetrators of horrible crimes, by lethal injection or even firing squad - I say that is a culture of vengeance," he said. "An eye for an eye and a tooth for a tooth - that is not our culture in Scotland and I would like to think that the US government, and these states that do still have capital punishment, would learn something from us." The cardinal said Americans should "direct their gaze inwards" rather than scrutinise how the Scottish justice system worked. He said the use of the death penalty meant the US kept "invidious company" with countries like Saudi Arabia and Iran. "In some states it's month by month now that they are killing people who have a right to live, whatever they've done wrong," he said. He also backed the Scottish government's decision not to give evidence to American senators investigating Megrahi's release. "The Scottish government has made the decision and the Scottish government is answerable to the Scottish people - not the US government or US citizens. "Everyone acted according to Scots law in releasing Megrahi on compassionate grounds, having taken medical advice. "I still think they did the right thing, although the man is still alive. "We shouldn't be crawling out to America, or having them come here and questioning us on our own territory." Reacting to the cardinal's comments, Deputy First Minister Nicola Sturgeon told the BBC that the Scottish government's position remained that it had nothing to hide. She said: "Al-Megrahi's release was a release on compassionate grounds, Kenny MacAskill has already made that clear and we've made that clear to the United States Senate." Can you really predict a prisoner's death? What are the grounds for compassionate leave from prison?